KHERSON, Ukraine -- Masked, pro-Russian activists in eastern Ukraine have begun looting government offices in Donetsk, the largest and most influential city of Ukraine's industrialized eastern and southern provinces, in a move that could portend further fragmenting of the beleaguered nation. According to the few independent media outlets remaining in the city, masked men on Monday night were seen carrying computer servers from the Donetsk Province government administration building. Earlier in the day, separatist leaders declared the creation of the Donetsk People's Republic. The so-called declaration of independence, which was broadcast via Internet, said that “the people of Donetsk People's Republic have an exclusive right to its land, subsoil, air space, water and other natural resources” and that the newly created republic has a right for an independent financial, economic and other policies. “This is effective from the moment of its approval and serves as basis for approval of the Constitution of Donetsk People's Republic,” said the declaration, which said a referendum on approving the province's new status would be held no later than May 11. The latest development in Donetsk is an indication that Kiev is losing its grip over Ukraine's industrialized eastern provinces, where most people grow up near coal mines, chemical factories and metallurgical plants. An almost identical measure was passed hours later by separatists who had occupied the Kharkiv Province government administration building. Ukrainian officials said Tuesday they had recaptured that building. In Luhansk, unknown “separatists” brandishing arms and explosives were keeping 60 people hostage inside a security service branch the Ukrainian Security Service said in a statement Tuesday. It is not clear who the hostages were or if they were security service employees. The building was seized Sunday by pro-Russian protesters. Former prime minister and presidential candidate Yulia Tymoshenko, who visited eastern Ukraine on Monday, said Russian interlopers were behind the shenanigans. “Organized groups of several hundred people representing Russian security agencies have arrived in eastern Ukraine from neighboring Russia,” she said. In a televised address on Monday, Prime Minister ArseniyYatseniuk said that the pro-Russian meetings that had started off in the eastern regions in March had mostly calmed down, and only 1,000-1,500 radicals were left in each region. Ukraine's State Security agency said it has arrested several Russian citizens it says are responsible for organizing the unrest. Internet radio communications from Sunday and Monday monitored by FoxNews.com indicate that the events in Donetsk, Luhansk and Kharkiv are indeed coordinated from abroad by people with Russian accents. Meanwhile, the majority of the population of eastern regions of the country remained silently complicit with what is happening, possibly a reflection of their attitude toward the ousting of disgraced former President Viktor Yanukovych, who fled Ukraine to Russia in late February. Yanukovych, an ethnic Russian, was especially popular in eastern Ukraine. According to a nationwide poll by GfK-Ukraine conduced between March 4-18, only 12 percent of the southern areas of Ukraine and 9 percent of residents in eastern Ukraine believe the country is moving in the right direction. The split was evident Tuesday morning in Kiev, where a fistfight broke out in Parliament. Fortunately for the amateur brawlers, it does not appear that Vitali Klitschko, the world heavyweight champion-turned Ukrainian politician, was involved, but it came after Klitschko, leader of the Ukrainian Democratic Alliance for Reform party, told lawmakers that Ukraine was facing a "real war" as a result of the events in Kharkiv and Donetsk. Shortly after he spoke, Petro Symonenko, the head of the Communist Party, told lawmakers that their own actions in bringing down the government of Yanukovych had set the precedent for what was now occurring. 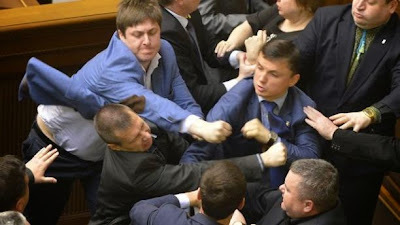 Nationalist lawmakers angered by the remarks rushed the podium where Symonenko was speaking, resulting in a brawl involving several people. According to Reuters, two deputies from a far-right nationalist party seized Symonenko and his supporters rallied to his defense. According to The Telegraph, this is not the first fight in Ukraine parliament. A fight broke out in February after some demanded a snap presidential election.